-	You are using MATLAB R2013b or earlier (but not earlier than R2011a). Finally, more detailed info about use and troubleshooting can be found in the readme.txt file contained in this submission. "readme.txt" included ArduinoIO folder says the solutions to above problem. Aishwarya you cannot generate code from th eSimulink blocks in this package. If you need to build algorithms that run standalone on your Arduino, then you need to uninstall this package, remove the blocks from your Simulink model and make sure you use the blocks from the official Simulink support package for Arduino. Otherwise you can use the blocks in this package to interactively stream data from the Arduino to your computer and viceversa, provided the connection is always on and working. But in this case you can't click on the "Build" button (which generates code and an Arduino executable), you can only click on the "Play" or "Run Simulation" button. ### Build procedure for model: 'motor_test11' aborted due to an error. I searched the directory, but could not find the file. Is there any option to download it from net? I uninstalled and reinstalled the Legacy add-on, still no use. Jayanth, I think maybe you are using the wrong sketch. You need to upload the motor_v1.pde sketch to the board. Also before that you need to install the Adafruit motor shield library as explained in the readme.txt file. Undefined function or variable 'motorRun'. i want to activate the MATLAB R2012 version. and serial number but it still asking for activation key..
can any one solve this problem and kindly help me in this regard..
Andrea, just remove from the MATLAB path the ArduinoIO folder and its subfolders. Hello! How to UNinstall the package? Thank you for your quick response. I already tried to use the solution that u suggested. unfortunately, I get the problem that the changes of the value of the DIV allow only some specified frequencies. How can I have a specific frequency e.g. 1000 Hz? Chahid, the easiest way it's probably go to the .pde file that you are using, find the analogWrite instructions, and before insert a setPwmFrequency(pin,div) instruction just before the analogWrite (see here: https://playground.arduino.cc/Code/PwmFrequency). Make sure you read the instructions in that document, and you understand what you are doing before you do it. Perhaps use the adio.pde file first which is easier to understand. How to change frequency of PWM ?? 1 In the Arduino software(IDE). You need write the code, which you find in file "adioes.pde"
There are three files adio, adioe, adioes. A for analog D for digital I for input O for Output E for encoder S for Servo. If you need a Servo o a encoder, you need put the code more complete adioes. Hi, I'm using MATLAB R2014b with Arduino Uno and Adafruit Motor Driver V1. All the steps are succesfully preformed >> upload motor_V1.pde, install arduino IO to Matlab. But when I try to control a stepper in MATLAB, it displays in command window but stepper doesn't move. Can anyone help me out of this. cable before attempting a reconnection. I've tried using different USB ports, and I'm not sure what else to do. Any help would be much appreciated, thanks! Chetan, the link you posted does not seem accessible from my account. Perhaps you need to open it to everybody ? HELP! Can I combine the codes shown below in adiosrv.pde? and if I edit the Serial.print's in the default adiosrv.pde, will it still run on matlab? Can the motor_v2.pde combined with arduino.m codes run 2 Adafruit Motor Shields stacked onto the same Arduino board? Things work great with a single motor shield, but it would be great to control 5 or more motors. La terminal 9 genera una señal digital de 490 Hz con un ciclo de servicio del 155/255 por ciento. Necesitas un filtro pasabajas para medir su valor promedio. Conecta una resistencia de 47 kOhm entre la terminal 9 y la terminal A5, y un capacitor de 1 microF de la terminal A5 a GND. and then connected pin 9 to pin 5, but it does not reyd 155. Why? Arduino IO: Legacy MATLAB and Simulink Support for Arduino. Tethered mode only (code executes on the laptop), no code generation. Official MATLAB Support Package for Arduino: New MATLAB ONLY support for Arduino. Tethered mode only. No Simulink Support. Official Simulink Support Package for Arduino: New Simulink support for Arduino. Code generation only. Simulink models executes on the Arduino Board. No interactive (tethered) support from the MATLAB command line. Embedded Coder target for Arduino. Similar to the Simulink support package, with the following differences: 1) It needs both Simulink and Embedded Coder. 2) It gives access to a bunch of code generation optimization options. 3) It might also support a slightly larger setoff boards. I am unable to install the Arduino mega app in Simulink because it is giving error in the Temp folder, says he can not write information there. You can set the matlab to record the insformações of his packages in another folder other than the Temp folder ?. I'm using windows 8 and matlab 2015th. Please, help me. I have a Duemilanove arduino and I can't deploy my model, that write to digital output, to hardware. There are something that I cand do? What kind of arduino that I have to use to? how to do transmit serial data using .pde file and matlab gui? It is possible to send a Matlab variable through serial port for having Arduino taking decisions depending of the value of this variable (that btw, it changes with the time)? When I install the arduino HW package for Matlab it works fine for me but not for anyone else. Since these are lab PCs many students use them. So the install has to work for all users. This is needed. However to make matters worse, by installing the arduino software it has messed up the path file. So now when anyone other than me tries to use Matlab at all it comes up with an error (serious) and then requires them to re-run the defaultpath command to run at all. So in short, by me installing the arduino package has broken all the lab PCs now. Please tell me how to install the arduino so that all users can use it without breaking the path. >> Undefined function or variable 'arduino'. I am having problems with rotating a servo and acquiring values from a sensor at the same time. If I do not use the servo, the analog readings are accurate, but once I attach it, the sensor data shows only noise. Help please? Do you know the function to change the timer frequency of Arduino Leonardo or any function that can change the frequency of PWM of Arduino? Because I want to change the frequency of PWM signals that Arduino sends out to other devices. Thanks. hello, im working on a project with matlab and arduino+adafruit motor shild; to control a stepper motor. i've conected to the arduino board thorow to arduino software and succeed to contorl the motor. I tried to use the package on R2012a, with a UNO R3. The following script just leads to the built in LED on pin 13 being always on when I run the script however if I go into debug mode and step through the script then the LED turns on and off as you would expect as you execute the lines one by one. The Rx LED flashes approximately once per second when the script is running. Can anyone tell me why the LED doesn't flash on and off once per second for 60 seconds when I execute the script? thanks. We used MATLAB and an Arduino UNO (Ruggediuno) for our process control lab starting in 2013. We built 40 lab kits for ~$50 each and distributed them to students. Below is a link to our source code for the lab. The lab is featured in the December issue of CACHE news. The article includes a number of lessons learned with regards to improving student experience. It was a positive experience the second year (2014) after we worked out some important details. We're interested in continuing to improve the Arduino lab. Please contact me with any suggestions on additional modules related to Process Dynamics and Control: john.hedengren@byu.edu. Updating server code on Arduino Uno (COM5). Please wait. Cannot program Arduino board Uno (COM5). Please make sure the board is supported and the port and board type are correct. Do I still need to install something else? Is there a way to control PWM duty cycle of voltage? Unable to load a message catalog 'MATLAB:arduinoio:general'. Please check the file location and format. 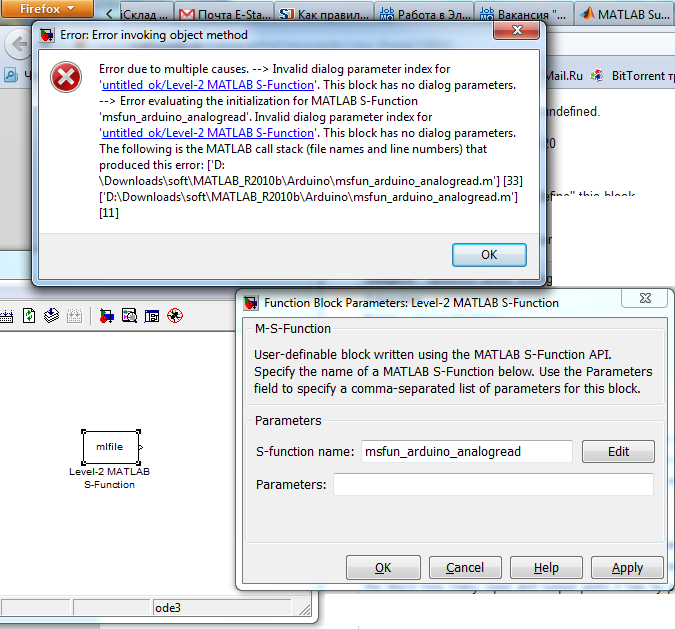 I already reinstalled matlab and all the packages, but still the same issue occurs. Hi, I was wondering if the Arduino IO package also allows me to use a Arduino library such as AccelStepper? If so do I have to take care of anyting special while installing Arduino IO, for example a special pde file? Thanks in advancefor your help! Connection unsuccessful, please make sure that the board is powered on, running a sketch provided with the package, and connected to the indicated serial port. You might also try to unplug and re-plug the USB cable before attempting a reconnection. Very good program but having trouble driving 2 motors simultaneously using adafruit motor shield. Can anyone help me out? Great package! Thanks a lot! "the sketch running on the Arduino does not support the motor shield. No operation will be performed on the Arduino board"
Did anybody set up the original Motor Shield successfully? Does this IO package include support for ultrasound sensors? My students haven't been able to communicate with ultrasound sensors via matlab. i tried to create a model block with simulink and some elemets of the library, but i cant use a in variable because it keeps giving me this error. Error due to multiple causes. when i run file "encoder_sim" in this package I got an error : " The corresponding 'msfun_arduino_io_setup.tlc' file for the MATLAB S-function 'msfun_arduino_io_setup' in block 'encoder_sim/Arduino IO Setup' must be located in the current working directory, the MATLAB S-function directory 'C:\Users\QuocToan\Downloads\matlab and arduino\ArduinoIO\simulink', or the directory 'C:\Users\QuocToan\Downloads\matlab and arduino\ArduinoIO\simulink\tlc_c'"
Is it possible with this support package to control a stepper motors with a different driver board or only with adafruit motor shield ? I have tried the source code. I use Arduino uno and ACS712 current sensor. how to improve the current measurement data transmission via the Arduino to matlab? i want the data to be transferred 1 second = 100 data (in Matlab). Can we do SPI write? Ι Cannot connect my arduino due with matlab. I keep trying to export the adioe.pde to arduino, but i keep gettinh the erros message "Board at COM1 is not available"
hi, i have 2 other codes aside from adioes and I have to compile the three together as one sketch. how an I do this? Matlab and Arduino due? Are they compatible? Does anybody know it? Please try to include Software Serial option into this! ??? Attempt to reference field of non-structure array. Excuse me, I have a problem(does not work analog and digital inputs in model of Simulink(Arduino)...constantly shows "0" on Scope( What can I do ?? Matlab is the best software tool out there! why encoder read the value only in steps (-32768 to 32767) via serial port?? Super Like for this package! Work Wonderfully. I tried a lot of others with live update but nothing worked. Does the new Version (from 29.Oct 2013) work with the 'official' Motorshield + Stepper Motor? The old one doesn't? Are there informations how to run the 'official' Motorshield. I have successfully installed all IO files, .pde files, and can connect my arduino (plus motor shield) to matlab. However, when the connection is established, matlab lists off servos 2-69, instead of the 2 associated with my motor shield. Additionally, no commands will operate my stepper, servos or motors (which I have tested in the IDE workspace, they work fine). Motor Shield Script detected ! But nothing works? Any idea? Hi, I am trying to run a stepper motor using a seeedstudio motor shield v1.0 paired with an arduino uno, and it is totally fine running the stepper in the arduino IDE but I haven't managed to budge it using MATLAB. I have been successful moving servos and reading analog voltages through MATLAB, so maybe the problem is the motor shield? I would like to ask, how can I expand the number of pins for each block example Digital Write Block to up to 31 pins. As you know Arduino Mega have 31 pins of Digital IO and 16 A/D pins. The block is limited to 15 pins for Digital Write I/O. Please help me on this because I need more pins for my current project. OK, found a video that helps figuring it out. Can't figure out the problem, even after following Gagan's advices. Installed in my MAC pro, MATLAB R2012b, and Arduino UNO. When Arduino and Matlab work together using the arduino io library. What's the clock speed? "??? Undefined function or method 'arduino' for input arguments of type 'char'." i can't figure out why. can anybody help me? A question: someone have tried to send a value of angle to a servo from a variable? where"ang" is variable. I have tried to program this, but matlab says it isnt a valid argument.......some ideas? Is there a similar srv.pde file for Aeroquad shields instead of Adafruit shields? Thanks a lot for providing this package and I did not seem to have any problems with Arduino Uno. THe Error and warning occurred while onnecting arduino: Warning: Unsuccessful read: A timeout occurred before the Terminator was reached. Error using arduino (line 101) Connection unsuccessful, please make sure that the Arduino is powered on, running either srv.pde, adiosrv.pde or mororsrv.pde, and that the board is connected to the indicated serial port. You might also try to unplug and re-plug the USB cable before attempting a reconnection. A class definition must be in an "@" directory. this will give u the elapsed time till pingpin goes high. 2.Use SD card shield to record the data and plot it if u don't need to plot it realtime. if u require real time plot then go for 1. 3.This method is the alternative of 2 without using sd card shield and is 'JUGAD' method. serial print the distance data in the monitor.once u r done copy paste it as a variable in matlab and do synthesis or analysis whatever u want. I am using a ultrasonic distance sensor in my project and it seems that the ArduinoIO Package doesn't support it. Reading the sensor requires the "pulsein" function, which seems not available in the Matlab environment. Any possible solution? P.S. I need to control DC motors (using PWM) according to the distance read from the sensors. At the same time, the distance data needs to be taken down, analyzed and used to draw graph so Matlab seems essential. I am working on a project to run 2 stepper motors simultaneously using Matlab. I was able to run the 2 motors in Matlab using an Uno and a motorshield (after uploading the srv.pde. The srv.pde is required for the shield to work in my case. ), but I wasn't able to run the motors simultaneously. I tried I2C with an another Uno and using the Wire library (http://arduino.cc/en/Tutorial/MasterWriter) in addition to the AccelStepper library, I was able to run the motors simultaneously using the Arduino 1.0.2 software. Is there a way of adding the Wire and AccelStepper libraries to the srv.pde so that I can use I2C and AccelStepper in Matlab? Is there another way of running 2 motors simultaneously using Matlab? I had some mistakes regarding previous comment. I want to interface an adis16480 IMU sensor with matlab, however this is not possible using the ug-287 evaluation board. 1)Now I am wondering if it is possible to read spi ports using arduino and read from arduino using matlab in real time? 2)And how possible it is to write and read from Maltab to the Spi Ports of the ADIS16480 (through arduino)? 3)Should I use arduino uno, Duemilanove or MEGA 2560 for simplest communications between ADIS16480 spi ports and matlab? 1)Now I am wondering if it is possible to read serial ports using arduino and read from arduino using matlab in real time? 2)And how possible it is to write and read from Maltab to the Serial Ports of the ADIS16480 (through arduino)? 3)Should I use arduino uno, Duemilanove or MEGA 2560 for simplest communications between ADIS16480 serial ports and matlab? I'm running Arduino IO with an Arduino MEGA 2560. Unallowed value for analog input pin number, the value must be an integer going from 0 to 5"
3.The IDE must be closed or disconnected so that MATLAB can use the serial connection. Hope this will be beneficial for you...GUD LUCK and enjoy support package its really good stuff. I installed the arduino on windows xp. And I followed the steps to install the arduino package in Matlab. "install_arduino" works fine. "arduino('COM3')" always fail. It said that "Undefined function or variable 'private'. " Andy body know what's wrong with it? Very very useful for the arduino's increasing capabilities! very usefull for arduino increasing capabilities. to connect arduino by matlab2010a, but error. What problem is it? The board is OK? Warning: A timeout occurred before the Terminator was reached. re-plug the USB cable before attempting a reconnection. Everything works for me. There are limitations but it is cool. Do i have to delete all the support package .m files in the existing path to work with a new code in a different path??? I had a problem timeout and error communication. I fixed this issue by changing ADIORSV:PDE on line 40, where there is a cicle for 20 PINS (insetad of 13 of Arduino Duemilanove). Hello, I was wondering if the arduino io would work with the liquid crystal library for the Arduino? I am trying to display a message from matlab on an LCD using the arduino. I successfully used Arduino I/O with MATLAB R2009b. Only some Port COM problems due to XP platform: return to default port number after a deconnexion of Arduino board. Undefined function or variable 'private'. Is it possible to solve the problem on this version R2007b of Matlab or have I to take time to install R2012a on all classrooms? i am trying to control the motion of a motor by using simulink blocks(of arduino matlab support package).i need an encoder(position) input as feed back in my control model. can any one help me how can i read encoder value in my control model? Abhineet, please post your question at http://www.mathworks.com/matlabcentral/answers, as noted above. I will be happy to answer it there. First of all I must thank you for providing us with such a nice interface between MATLAB and Arduino. Actually I was wondering if you have any function like Arduino's 'MAP' function which can actually map analoginput data into a specific range. Jose: The readme.txt file included with the support package has instructions for how to modify the code to work with Arduino Mega (search for "ARDUINO MEGA" in the readme.txt). I'm actually using and Arduino Mega 2560 and API_Matlab. But I have a problem, I cant's access to all PWM outputs, because the library just recognize as PWM the digital pins 3 5 7 9 10 and 11, that are the PWM pins of Arduino Uno Board. Did you know how can I access to all PWM pins of Arduino Mega 2560? Alex, thanks for the feedback, i'll think about it. Abdullah, it's because the servo methods were made to support the adafruit motor shield, which only supports servo connected to pins 9 and 10. I will remove this limitation sometime this summer. However if you look at the code it should not be too hard to modify it to extend it to 6 servos. why ı can connect servo just pin 9 and 10. I have 4 more pwm pin.. ? anyone can edit the files and blocks to add 6 servos to the arduino. using a.stepperStep() has a maximum number of steps of 255 and causes unexpexted results with for loops. How can i avoid this and get the number of steps i want. UPDATE: in the new version (3.2) the problem due to the fact that INTERNAL is not declared for the MEGA has been solved (basically now there is a macro that defines INTERNAL as equal to INTERNAL1V1 when compiling for the MEGA). Please consider downloading the last version if you often switch between the UNO and MEGA boards. and I ingnore it matlab just quit. Even the demo cannot work. Anyone has ideas? So just replace "INTERNAL" with "INTERNAL1V1" and it should work. adiosrv:239: error: 'INTERNAL' was not declared in this scope"
This is a total hack, but for those of you who are getting 'Connection unsuccessful' error and are sure that the serial port is working fine (i.e. by checking it with a program like TeraTerm and typing in '99') then you can set chk to be 1 (or 2 or 3), depending on which pde you had uploaded into the Arduino. chk = 1; % SHOULDN'T HAVE TO DO THIS! I am having problem with loading the srv.pde file to Arduino Mega 2560. I have done all the steps before this step. Please Help. And thanks in advance. I have installed all packages for Arduino support. In Matlab command line can successfully connect to Arduino and operate all its pins. Can I go another way to read data from Arduino in Simulink? I just want to use my Arduino as Analog Input in Simulink. Your problem seems like the one I ran into as well. What I did was double check my COM port in device manager. Opened up matlab and clicked in the "Current Folder" pane, navigated to where I unzipped the "ArduinoIO" package, right clicked the folder and added it and its subdirectories othe path, then execute the "savepath" command. Does anyone know what might be going wrong? I already also tried a=arduino('/dev/ttyUSB0') instead of COM4 but I got the same error. Added one space in the description. Removed reference and link to the old webinar. Updated description indicating new options for projects based on R2014a or higher. Improved handling of mega-related pins from Simulink ADIO blocks. Also added instruction (in the readme.txt file) on how to use the official stepper.h Arduino library with this package. Reorganized sketch handling and examples, improved docs and added support for Adafruit Motor Shield V2. Minor fixes and improvements, mainly for the MEGA and ChipKIT32 boards.